When is Weapon Damage King? So i just picked up a "The Zweihander" with much higher Damage than anything else I have, as you can see I have a few ok weapons. Am I right in thinking the Zweihander is the better option as I Don't need to build around it and it affects all skills not just one? Why on earth would you use the Zweihander when you have those amazing weapons. Both Maximus and Prophecy are OP weapons, sheet damage isn't everything. Of course, if you really hate the fire demon and don't want to use condemn for whatever reason, you can use this instead. Your prophecy blade is a dream come true though, it even has holy damage. I would use Maximus for sure, havnt tried the blade of prophecy so I can't be to sure about that but I know Maximus is one of the best 2handers. The effect of Blade of Prophecy is incredible, seriously. For starters, it straight up doubles condemn's damage single target. And in a pack? Picture 4 mobs all hitting each other with condemn, after you hit them with condemn. Quintuple damage. It doesn't also trigger condemn's rune, but rather the explosion just goes off instantly on the mob as well. Golden Flens can be brutal as well, allowing you to basically spam Sweep if a pack of mobs is large enough. Couple it with a Cindercoat and you might not need to hit your generator on large packs at all. And doubling bombardment impacts... well, so many strong Crusader builds use bombardment, why wouldn't you consider that? Well, the whole point of the best legendaries is to change your playstyle, really. 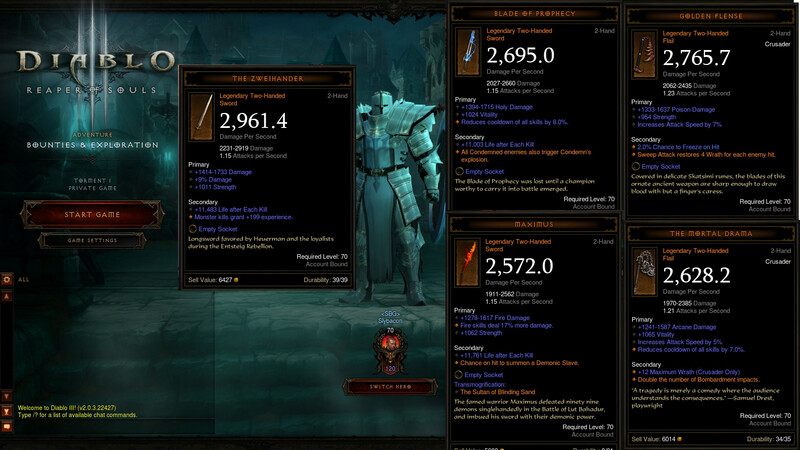 Build your playstyle around your gear, rather than just trying to maximize your sheet damage. For example, two of the first legs I got upon hitting 70 were a Blade of Prophecy and an Eberli Chalo shield (reduces Heaven's Fury CD by 45%) so I've decided to go with a build that uses both of them for constant throughput damage, omitting Bombardment from my spec so I'm focused on more constant damage, rather than one huge damage spike followed by a long low damage period.